A new survey by FocusEconomics released Tuesday shows that the majority of the 22 international and local macroeconomic experts polled believe that uncertainty surrounding the elections in France is not affecting the economy as a Le Pen defeat is likely. After a year characterized by Brexit, a migrant crisis, populist movements and the election of Donald Trump, uncertainty in the European Union economy is high. While economic data has remained resilient thus far, politics will likely stay in the spotlight this year and threaten confidence as a number of high profile economies hold elections, including France, Germany, The Netherlands and Italy. In a context of waning support for the status quo and recent election polls failing to predict results, Senior Economist Angela Bouzanis takes a look at the upcoming votes we are keeping an eye on and why. After dragging Greece kicking and screaming through a never-ending vicious cycle of fiscal adjustment and output decline, the European Commission seems to be softening in its attitude towards other struggling Eurozone economies. France, Italy, Portugal and Spain, among others, have all repeatedly been given extensions to reduce their debt and deficit levels after recurrent breaches of EU targets have gone unpunished, and the trend looks set to continue as our forecasts show that those economies will underperform again this year and next. Does this mark a shift in mindset within the Commission as to whether the Growth and Stability Pact is fit for purpose? Or rather just tactical maneuvering—or indeed resigned acceptance—in tough political times, as the EU faces unprecedented challenges to its legitimacy and survival? The French economy has come under the spotlight again after disappointing GDP growth in the third quarter. Even the French government has now finally admitted that its 1.5% growth forecast for 2016 is overly optimistic, long after our analysts downgraded their forecasts. Ironically, one of many factors that has dragged on economic growth in France this year has been the ostensibly pro-growth labor reform introduced in the summer, or rather the strikes over it. These weighed on domestic demand earlier this year and will thereby play a part in penalizing France’s overall GDP growth in 2016. 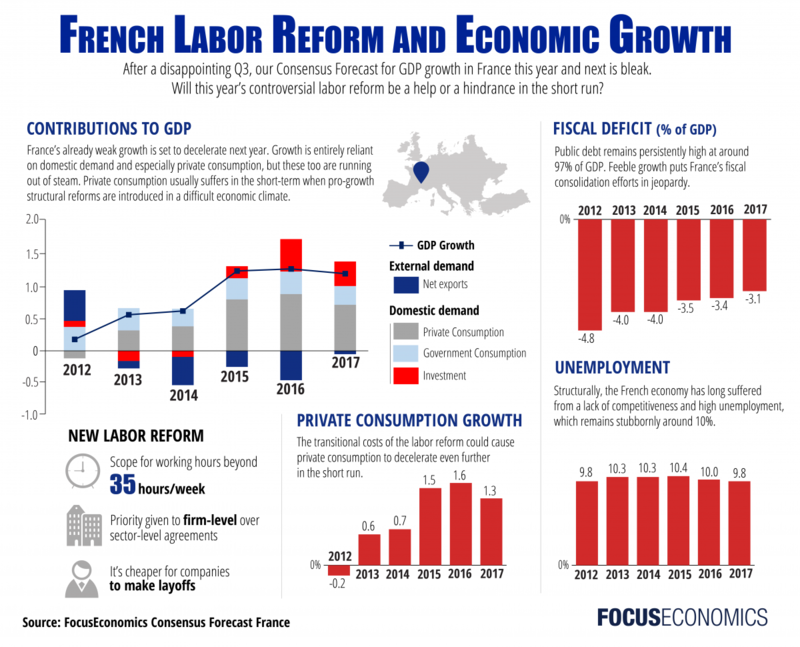 This calls for a closer look at the labor reform and what it means for French GDP growth going forward, particularly in a short-term perspective. Such a structural reform, if introduced in an already robust economic context, should have positive consequences for the economy almost from the outset. In the current environment of weak demand and constrained macroeconomic policy, however, the potential losses of the reform could well exceed the potential gains in the short-run, regardless of the eventual benefits that should hopefully win over in the medium- to long-term. 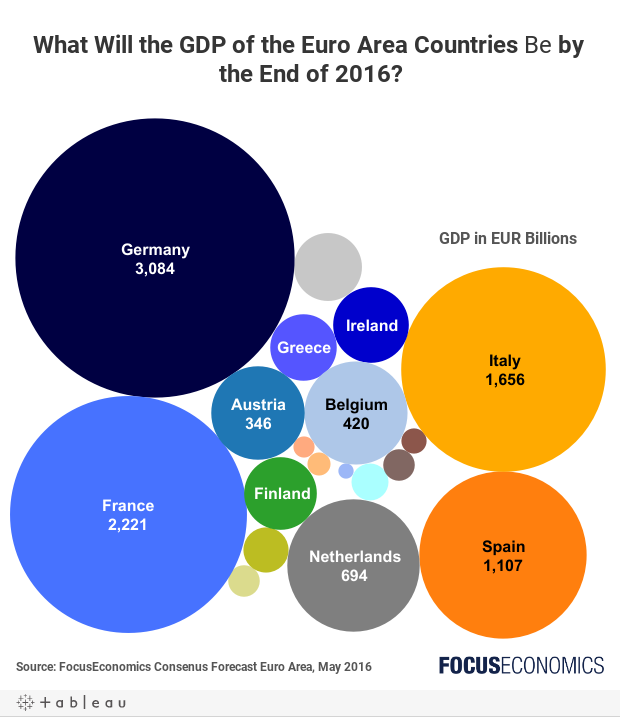 The Gross Domestic Product (GDP) in the Euro Area totaled EUR 10,404 billion in 2015 and is expected to total EUR 10,607 billion by the end of this year. Analysts expect the Eurozone economy to grow a healthy 1.5% this year and 1.6% in 2017. However, the Eurozone is still facing a number of challenges and performing below its potential. High debt levels, a fragile banking sector and a persistent lack of inflationary pressure continues to impede the recovery of many economies in the region. The French economy has underperformed in recent years and is facing challenges to stimulate economic growth due to a loss of competitiveness and the fact that much-needed structural reforms have yet to be implemented. Nevertheless, the country may see a pick-up in economic activity next year, should President François Hollande’s government succeed in implementing reforms.15 when FocusEconomics Consensus Forecast panelists see the economy expanding 1.0%.